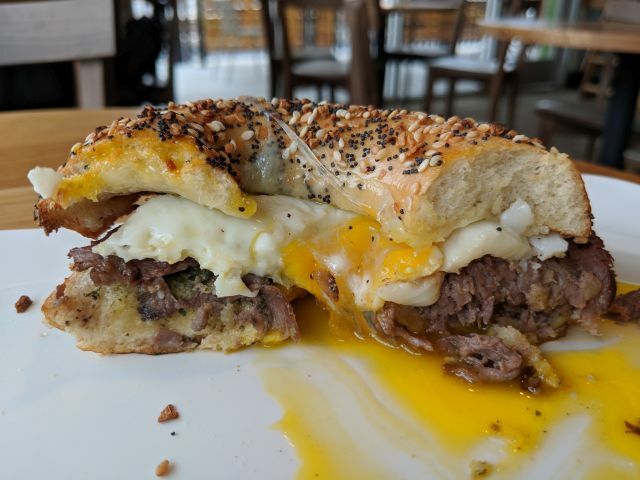 Panera Bread's Steak & Egg Breakfast Sandwich features seared steak, an over-easy egg, and a slice of Vermont white cheddar on an everything bagel. It's normally $6.29 but there was a coupon in their mobile app for a free breakfast entree (only up to $6 apparently so I paid 29 cents plus tax for it). 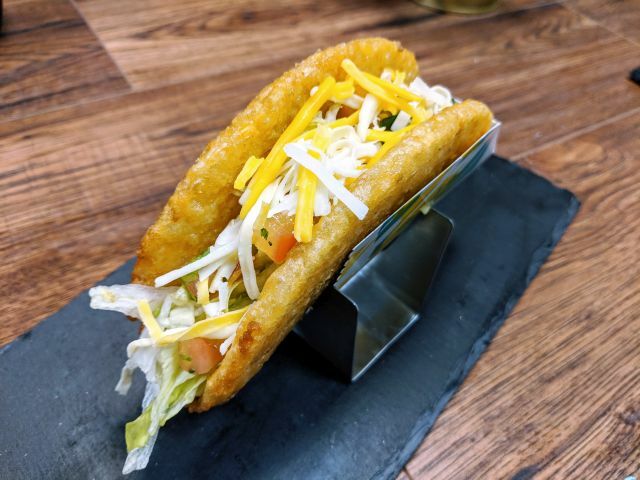 You can choose to get it with chipotle aioli, sweet maple, or basil pesto sauces to up the flavor. I went with the basil pesto. There was a really nice char on the bagel crust that made for a enjoyable burnt garlic and sesame quality and a notable crunch. However, the bagel itself was overly chewy (my jaw was somewhat sore by the time I finished it). The cheese was thoroughly melted and pretty mellow in flavor and the egg was nice and runny. The steak was tender but only lightly seasoned and under-flavored. This left the basil pesto to do most of the work and it, along with the everything bagel, did a bulk of the work with the rest of the ingredients mostly providing texture. 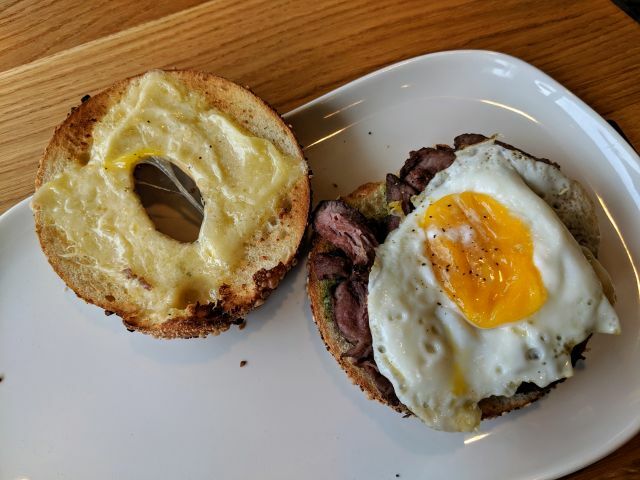 Overall, Panera Bread's Steak & Egg Breakfast Sandwich was a mixed bag for me. 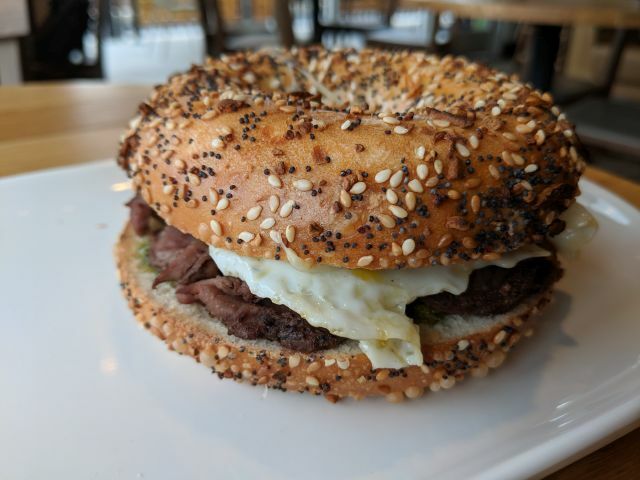 I liked the flavors, the runny egg, and the tenderness of the steak but the chew on the bagel was really bad and the steak really needs to step it up in the taste department, especially since the steak is supposed to be the highlight of the sandwich. As it stands, I feel like they could have forgone the steak entirely and still have had a delicious egg bagel sandwich.